Located in one of Chicago’s trendiest neighborhoods and only 10-minutes from the city center, Holiday Jones is the ideal place for visitors that want to experience Chicago like a native. Our guests enjoy free WiFi, and fresh linens & towels. Guests rest securely knowing we have 24-hour reception and security, key card entry to all rooms, and individual lockers in all shared rooms. We also provide free luggage storage on the day of your arrival/departure. We offer guests a variety of amenities including access to our large common room. 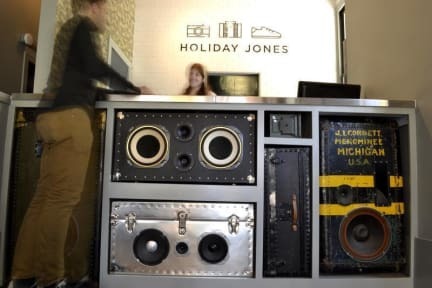 With a communal kitchen, foosball table, cable TV, guest computers, board games, and plenty of seating, guests at Holiday Jones will find it easy to relax and meet other travelers. Our bright and airy lobby offers an excellent place for business travelers to work and will soon be home to our very own restaurant, 5411 Empanadas. Our friendly staff are here to welcome you to Holiday Jones and Chicago. From directions to the most popular tourist spots, to dining and shopping recommendations off the beaten path, we are eager to share our knowledge of the city with you. 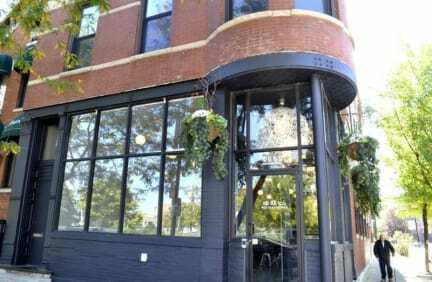 Located in the Wicker Park neighborhood, Holiday Jones is surrounded by cool bars, nightclubs, restaurants, boutiques, and art galleries. We are just a block from the Division Blue Line station which makes getting downtown and to the airport very simple and fast. We have a 48-hour cancellation policy. Late cancellations and no-shows are charged for the first nights stay. 17.4% tax will be added to list price. Guests can pay with cash, debit or credit card. We do not accept guests from any zip code which begins with 606. Dorm guests must provide a government issued photo ID. Fantastico ostello per visitare la città', a due passi dalla fermata della metro Division. I locali del quartiere inoltre sono favolosi - consiglio una visita soprattutto nei fine settimana, in alcuni locali suonano musica blues. Nota a favore di questo ostello a differenza di altri poi - possibilità parcheggio gratuito disponibile nei dintorni! Lo staff e' disponibile e amichevole anche per darvi utili suggerimenti per la vostra visita. Assolutamente consigliato!